Those fortunate enough to visit Bhutan describe Bhutan as a unique, deeply spiritual and mystical experience. This kingdom is an adventure like no other kingdom in the world. 100m above sea level in the South to over 7,500 m. above sea leve in the North. 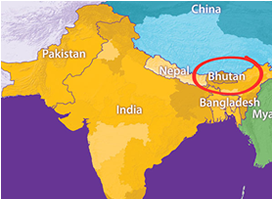 Bhutan’s official language is Dzongkha while English is widely spoken. Geographic regions from North to South; the high Himalayas of North, the hills and valleys of the central and the foothills and plains of the South.